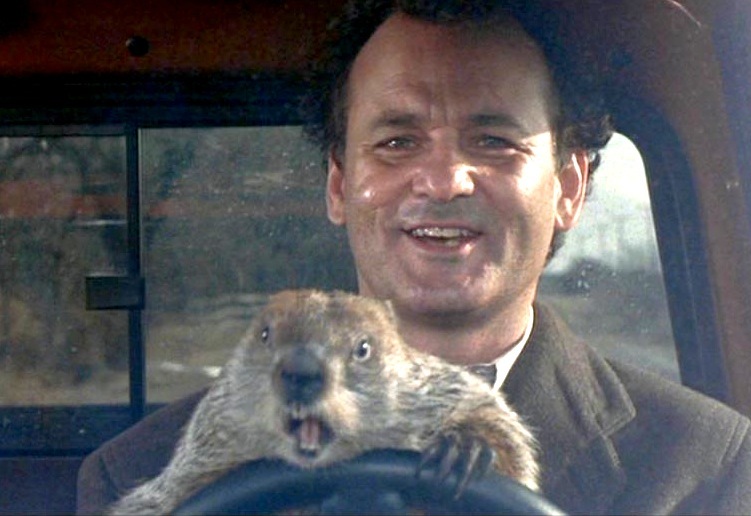 Luckily, I woke up for real a few minutes later, my "Groundhog Day" nightmare having been short lived. Unlike Bill Murray, I have options other than suicide attempts with a giant rodent to brighten my day, and one of them in Fulton Brewing Company's "Worthy Adversary". Fulton is one of my favorite local breweries, mainly because of they way they built their business. A few friends literally built their own brewing system in a garage, and brewed there for a few years before peddling their polished recipes to local bar owners. They built a small but dedicated local following, and in a few short years had saved up enough capital to start up full scale operations in Minneapolis. Talk about dreams coming true!! What's the matter? Can't see your shadow?!! Fulton describes this beer as follows: "An unchecked aggression of dark flavors, this rich stout is about drawing a line in the sand." Well then. In the words of the venerable Barney Stinson, "Challenge....ACCEPTED!". The pour is black, with a languid, halfhearted tan head that rises briefly, then recedes back into the darkness from whence it came. On the nose, dark, roasted malt is backed up by licorice and leather with cacao underpinnings. The taste is a bitter beatdown of the tongue. Bitter dark chocolate, bitter roasted malt, bitter hops, and sweet, warm booze. Very little if any dark fruit is present, though I suspect a little cellaring would help things along in that regard. This is a beer that no doubt would have survived the oceanic voyage from England to St. Petersburg and back again before mellowing out. The mouthfeel is incredibly full. Chewy doesn't begin to describe what's going on. Alcohol warmth is immediately present, and builds to the last sip, which finishes dry, but sweet. I wouldn't call this a smooth beer, but again, a little cellaring would likely change that. Overall, I think this is a solid offering from a company I very much respect, but it needs to age before realizing it's full potential.